Last weekend I made a quick trip up to Kansas City with my brother. 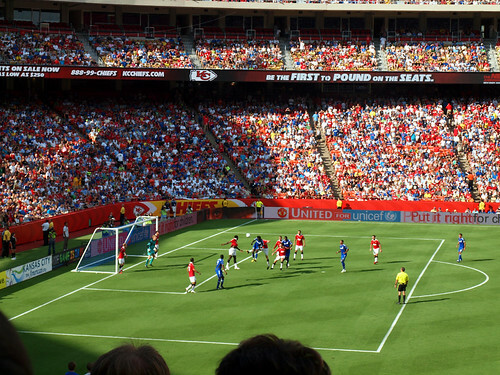 Our main reason for going was a soccer game - a friendly match between the Kansas City Wizards and Manchester United. It was just an exhibition match, there wasn't any trophy or championship on the line. But a huge crowd showed up for the match at Arrowhead Stadium - over 55,000 people. 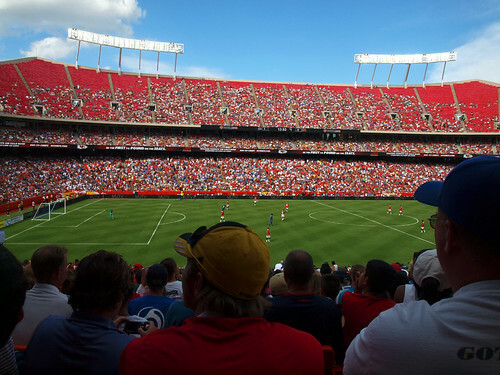 It was the largest crowd for a soccer match at Arrowhead, and the largest crowd ever for a soccer game in Kansas City. That will change, hopefully, when the USA gets the chance to host the World Cup (either 2018 or 2022). Manchester United is considered to be most popular soccer team in the world. They have the highest home attendance average in Europe, and millions of fans across the globe. The Kansas City Wizards are one of the original clubs in Major League Soccer, and won the MLS Cup in 2000 and were runners-up in 2004. They'll be getting their own stadium next year. I brought my camera to the game, but didn't try to bring in my zoom lens. I checked the stadium rules and saw that "professional" cameras weren't allowed. The definition of professional was that you couldn't have a detachable lens that extended over six inches. So all I could bring was my regular lens, which didn't allow for good shots of the field. After the game we headed to our hotel, which was conveniently located in the Country Club Plaza area. This is a neat area, built in the 1920's as a shopping center. The streets were laid-out in an European style, and the architecture made to resemble that of Seville, Spain. After getting dinner, I got the camera and went to take a few pictures. Just to the edge of the Plaza area is the J.C. Nichols Memorial Fountain. 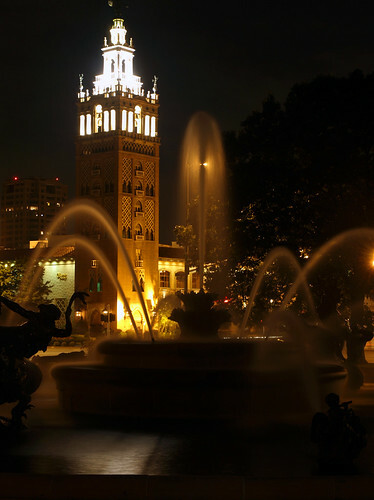 It's thought to be most photographed fountain in Kansas City. It is a neat spot, but unfortunately, the lights on the fountains were shut off the night I was there. And one last shot from Kansas City. 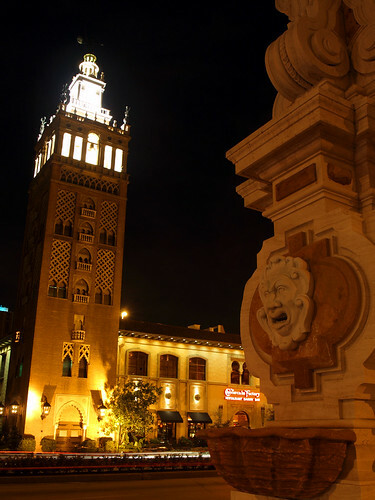 This is a view of the tallest building in the tower, which is a half-sized replica of the Giralda Tower in Seville. While I was in the area, I decided to make a quick visit to Erbie. 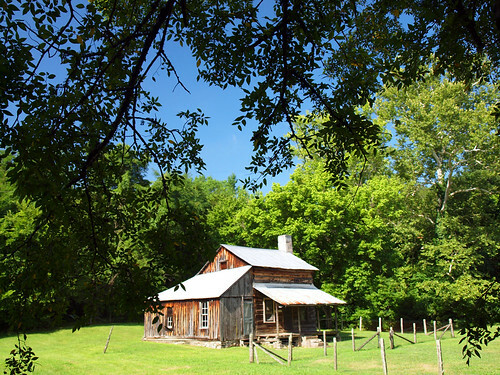 Past the campground along the Buffalo River is another great collection of old buildings - the Parker-Hickman Homestead. 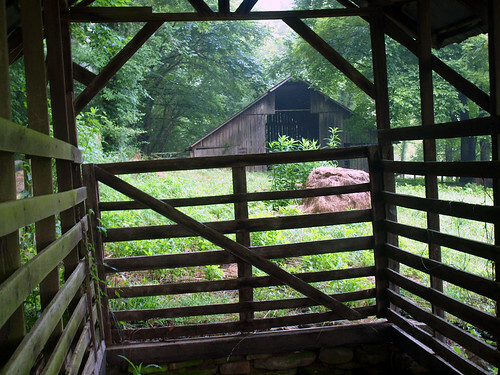 Several old barns stand next to the home, which is the oldest surviving building along the Buffalo National River. The old home was built between 1847 and 1849, by two brothers in the Parker family. They had travelled west from Tennessee and North Carolina, and settled in this valley. They were master builders, their construction on the house was so detailed that even today, it is impossible to stick a knife blade between the cedar logs (if you were so inclined to do so). The Parkers sold the home in 1857 and moved further west. 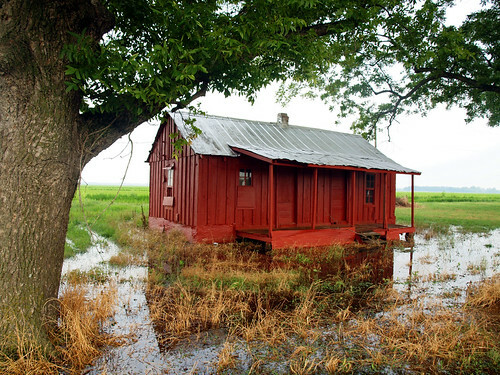 Other owners added barns, and a lean-to room that served as a country store in the 1920s. In 1912, the Hickman family occupied the home. The last person to occupy the old house was Gradon Hickman, who lived there with his dog until 1978. Then in 1982, the National Park Service bought the house and property. 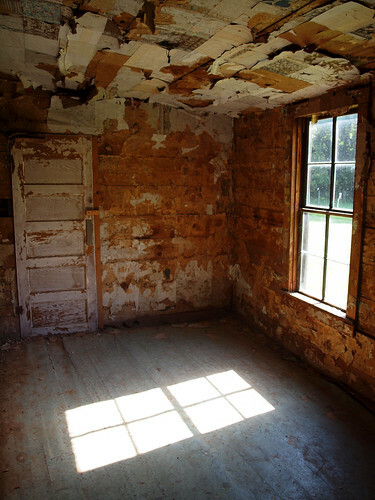 In 1984, the old homestead was stabilized and is now open for anyone to go in and have a look around. In 1987, the property was added onto the National Register of Historic Places. The old house is empty now, except for a few bumble bees, wasps and butterflies. I walked through the house, and went into the room that was added on as a lean-to. The early morning light was streaming in through the window. One really interesting detail here are the old newspapers that are plastered on the walls and ceiling. This was a common practice back in the olden days - the newspaper acted as a type of insulation. 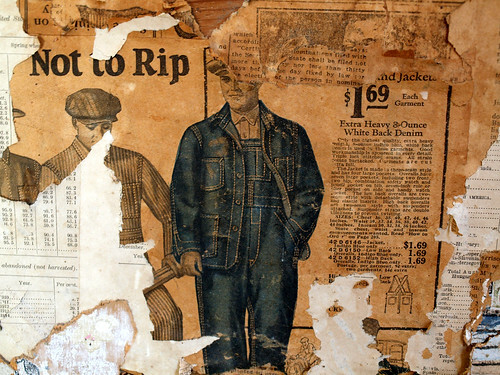 There are still lots of legible pieces of newspaper, which include comics, ads and stories. This is a close-up shot of an ad for overalls - a bargain at only $1.69 a pair. I tried to get a few shots of the old barns on the homestead property, but the sun was out in full-force and the light was too harsh. I went to open the gate, in order to head back to the car, but stopped to get a shot of this moth (or butterfly). 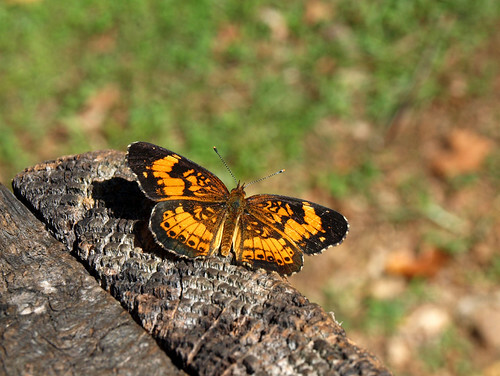 It was perched a bit lazily on top of the old weathered wood, and didn't mind getting its picture taken. It was dark when I drove into the campground at Lost Valley. 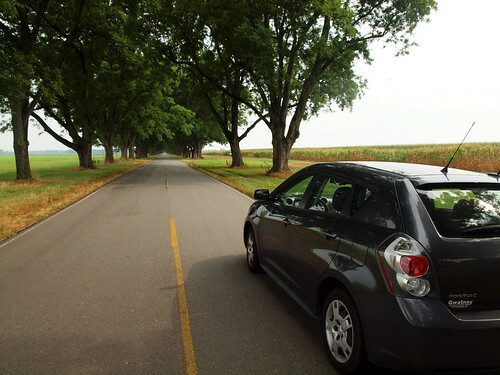 I was surprised to find the campground quiet and relatively empty, there were just a few cars in the parking lot. 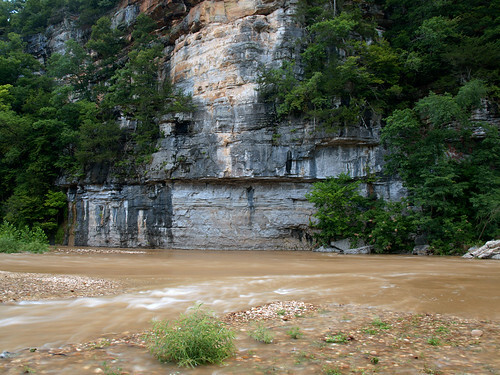 This is one of the most popular spots along the Buffalo River, and I expected it to be packed. I parked the car and went about getting my "campsite" prepared. I wasn't camping in the traditional sense. My plan was to camp in the car - by folding down the back seats of the Vibe in a make-shift tent. I brought along plenty of blankets and made a sort of nest in the back of the car. It wasn't as comfortable as I would have liked, but much easier than trying to put up a tent in the dark. The only problem was that, even with the back seats folded down, there wasn't quite enough space to stretch out completely. If the car was a few inches longer, or I was a few inches shorter, it would have worked out perfectly. It was somewhat cool at the campground, so at first I decided to keep the windows rolled up in an effort to keep the bugs out. This resulted in the car getting stuffy in the muggy summer night. And it also resulted in the windows fogging up. I decided to roll down the windows, in order to let in a breeze. And also to prevent a wandering park ranger to see a car with foggy windows and think that something nefarious was going on in the Vibe. 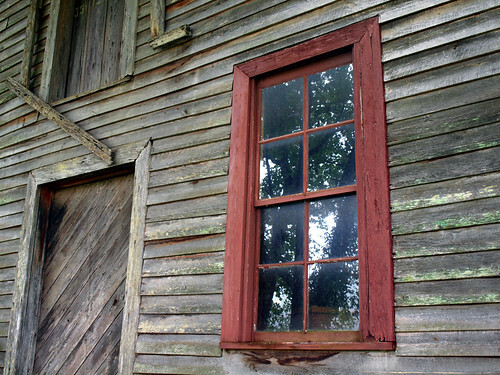 The cracked windows let in a nice breeze, and amazingly, very few visiting insects. I had set the alarm clock on my cell phone to go off at 5:30 am, but instead woke up earlier to the morning chirps of some birds hanging out in the campground. 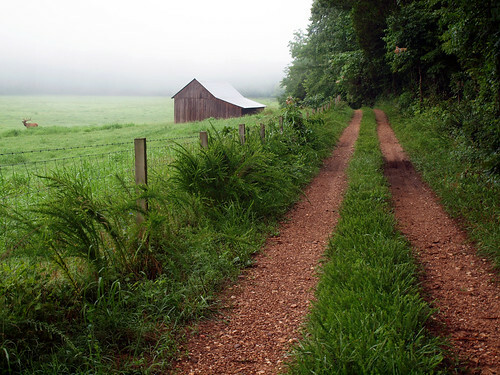 After packing the sleeping gear in the back and putting the seats in their locked and upright positions, I set out to explore Boxley Valley. I had hoped that the valley would be covered in fog, and amazingly, my plan actually worked out. A thick blanket of fog covered the valley. 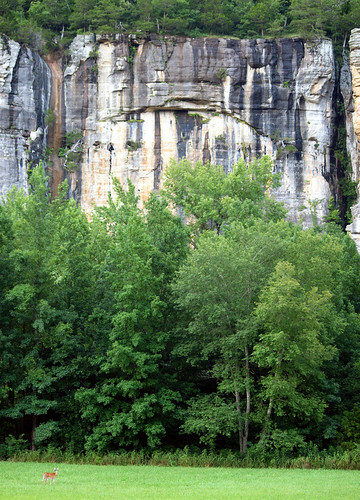 The Buffalo National River ranks as one of the most scenic places in the state, let alone this part of the country. 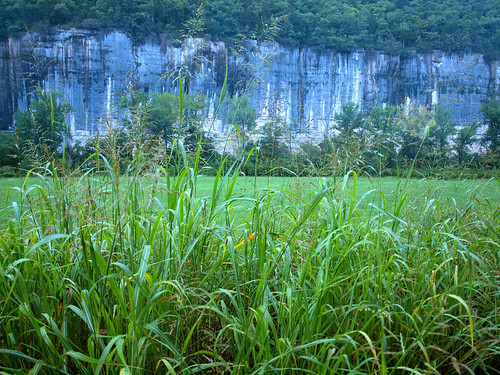 And Boxley Valley is perhaps one of the most special areas along the Buffalo. 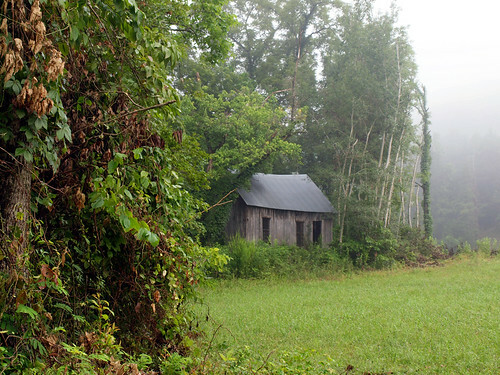 Boxley Valley is a historic district, and it has a deep history. Native Americans are thought to have lived in or around this area for centuries. 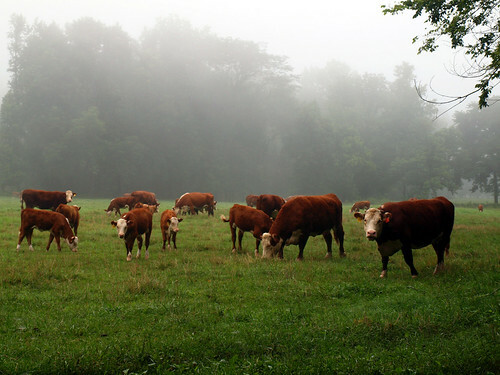 Settlers moved into the Boxley Valley and Buffalo River area around 1830. 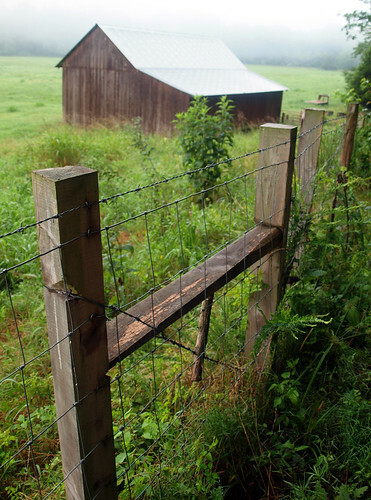 A few decades later, some Civil War fights occurred in Boxley Valley. Boxley quieted down after that, entering into a routine of farming in a remote stretch of land. 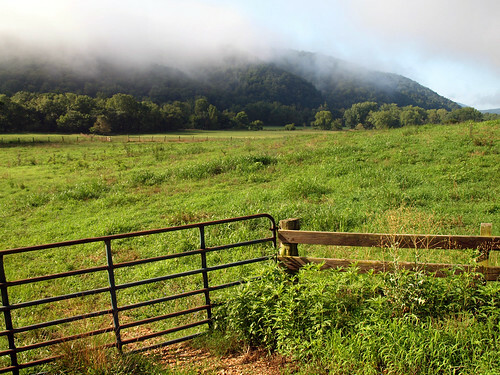 When the Buffalo River was established as the very first National River in 1972, the National Park Service wisely allowed the old residents of the valley to keep on maintaining their fields and farms. 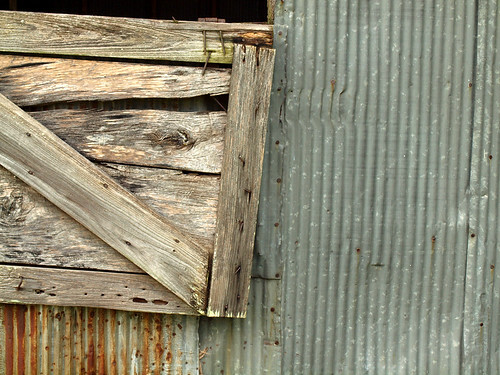 This preserved the old barns, homesteads, cemeteries and churches that had been in the old valley for over a century. A drive through the valley now showcases a way of life that was once prevalent in the Ozarks, but has now drifted away through the turbulent waters of history. The buildings you now see in Boxley have stood for over two centuries. It is an amazing and unique display of history, all laid out on a short seven mile drive. Along with that history, you have vast displays of wildlife. Herds of elk call Boxley Valley home, along with a few trumpeter swans. I drove through the valley in an attempt to see the elk, but they weren't in any of the fields along the road. I did see one elk, with a massive set of antlers, hanging out in a field near the old Boxley Valley Baptist Church. The bull elk was alone in the field, and wisely grew wary of me being nearby. The elk trotted off, heading off towards the nearby forest. I don't know why it would be scared of me. If an elk came charging at me with antlers like that, I'd probably crap my pants and then promptly pass out. 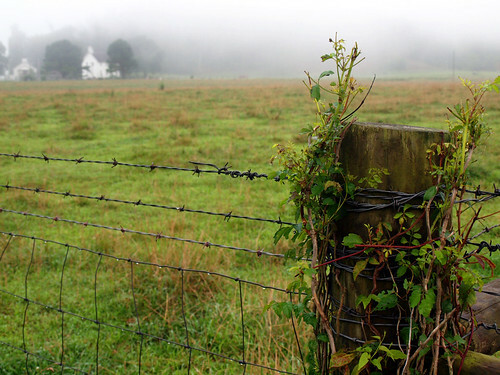 This is a shot of an old fence post, with all sorts of plants growing on it, with the old Boxley Valley Baptist Church in the distance. The old Boxley Baptist Church was built in 1899, but the church's history dates back to the 1830s. The church building also served as a school. A newer church was built next to the old church in the 1950s, but the old building still serves as a community center. 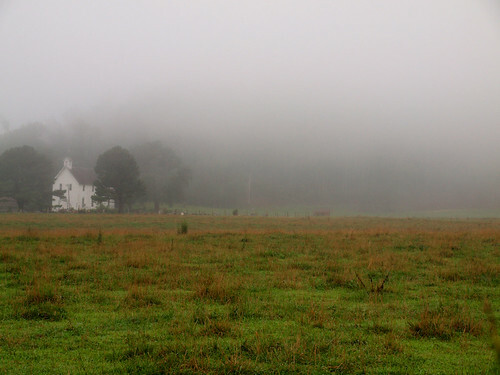 The fog was still thick has it hung over the valley, and I wished that I could stop time. 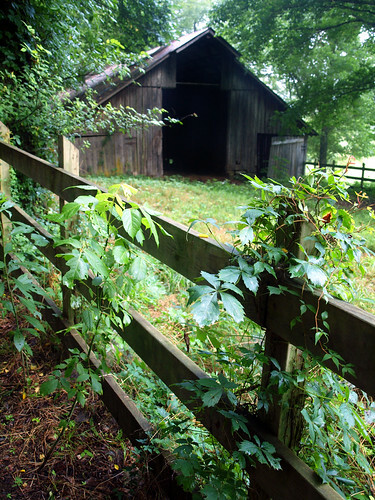 There are so many neat old barns and buildings in Boxley. 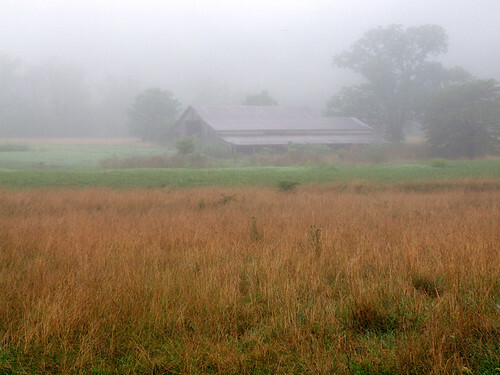 I felt like a kid in a candy store, and hoped that there was enough time to stop at all the sights along Boxley Valley before the fog finally lifted. 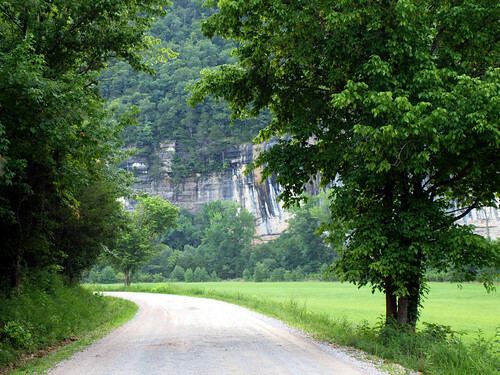 The trailhead for the Buffalo River trail sits next to a small parking area on the southern edge of Boxley Valley. Located across from the parking area are the remains of an old home, built in 1900. Tragically, the old home was burned by arsonists in 1990. All that remains are the foundation and the stump of a chimney. Just a short walk away is an old barn, built sometime in the 1920s. 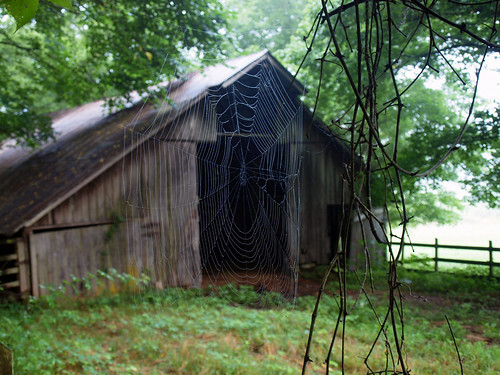 Here is a shot of a spider web, growing along the fence that lines the perimeter of the barn. Spider webs would be an ever-present aspect of this trip to the Buffalo River. I would end up walking right in the middle of several large spider webs, which would result in the sticky webs wrapping my face like a veil. I felt a bit sorry for the spiders, who must have spent so much time constructing their webs. All that effort, just to have some dumb human stroll head-first through the middle of their handiwork. Sorry guys. 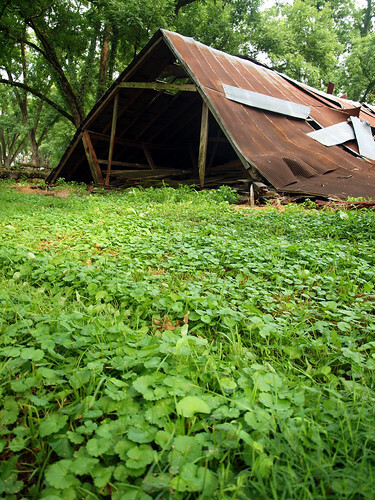 Here's another shot of the old barn, with summer growth overtaking the fence posts. Next I drove over to the old Boxley mill, which is a bit hidden from the main road. Not too many people visit the mill, probably because of some confusion about it being on private or public land. I had heard, from a reputable expert on all things Boxley Valley, that the old mill was indeed on public land. The mill and the property around it are on public land, and in fact the National Park Service is restoring the old mill. But when you head there, the gate to the mill is padlocked. 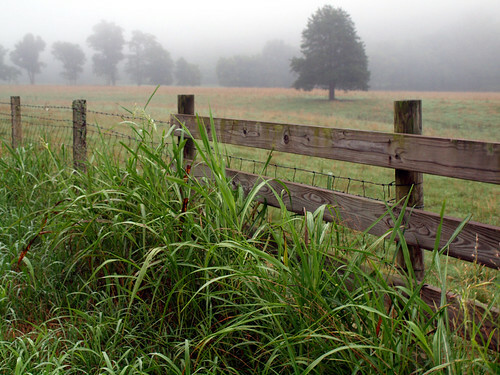 There is a sign along the gate that says: "These Boxley Valley lands are leased. 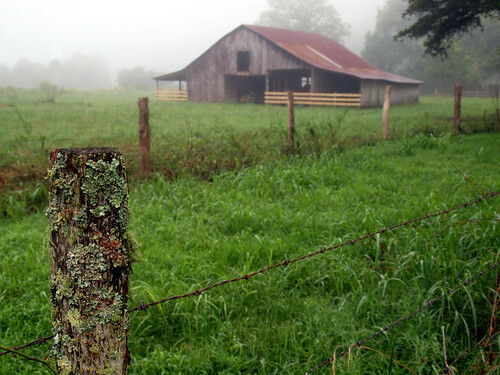 There is no public access to farm lands or farm buildings. Please respect this private use." There is a gate just next to the padlocked one, which had no warning sign posted. I went through that gate, not entirely sure if I was trespassing. There were many cows in the fields next to me, peering suspiciously at me as I passed. According to my Boxley Valley source, the area around the mill is open to the public. But "they" only offer tours of the mill on appointment. There was another gate leading to the mill, but it was padlocked as well. I ended up jumping the fence so I could a closer view. 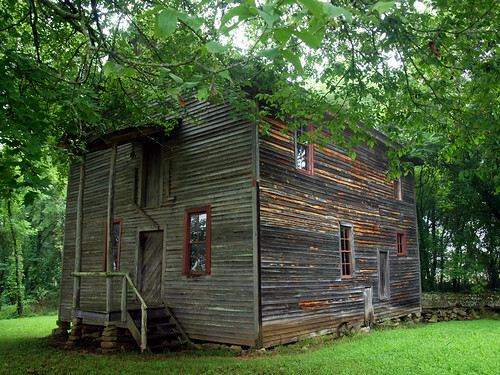 The Boxley mill was originally built circa 1840. It became known as the Villines Mill and then the Whiteley Mill. 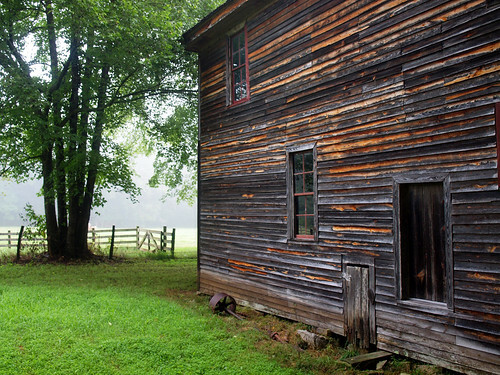 It was the site of a Civil War skirmish, known as the "Battle of Whiteley's Mill." The mill building that stands today was built in 1870. It was run by three generations of the Villines family, where people took corn in order to be ground to meal, or wheat for flour. Around 1950, the mill closed. Apparently, much of the original equipment in the mill is still there. But now it sits empty and nearly forgotten. I was nervous being there, and hoped that I would not get in trouble for trespassing on lands that I should perhaps be allowed to visit. I didn't linger too long. 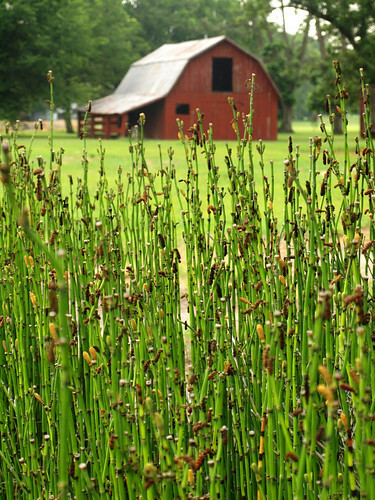 And a barn, located next to the Mill Pond. I drove over to the Ponca low-water bridge, just to see how high the water in the river was. The low-water bridge over the Buffalo is a local landmark. Construction on it first started in 1941, thanks to funding from the WPA. World War II halted the work, but it was completed by county workers in 1944. It's a narrow concrete bridge, but a popular gauge for local floaters to see if the river is good to set out canoes and kayaks. 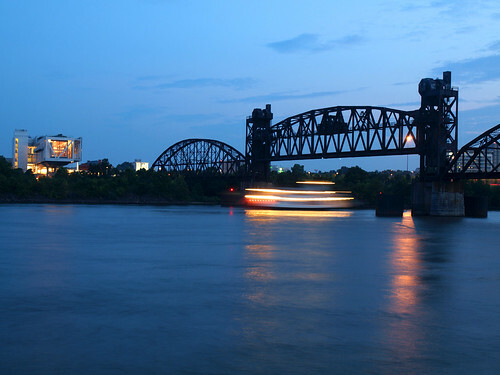 I headed out on the bridge with the camera and tripod, along with several people surveying the river. We watched as trailers moved in, with dozens of canoes attached. The water looked high and muddy to me, not something I'd want to float in. I got back in the car and drove up towards Lost Valley. Along the way is this old building, which may have once been an old school. I got back on the main road, just as the sun was starting to break through the fog. I had gotten about two awesome hours of photography out of that fog, and I was sad to see it depart. The sun broke free, but the fog stubbornly held on, clinging to the top of the mountains. I left Boxley Valley and headed back over to the Steele Creek campground. There were a few lingering bits of fog and low clouds in the valley by Steele Creek, and I hoped to catch it before it burned off. I needed to take a break last week, so I decided to make a quick little camping trip up to the Buffalo River. The upside to this was that the Buffalo River is one of the prettiest places around, and is always worth a visit. The considerable downside to this was that the trip was taken in the middle of the summer, when an air conditioner is your best friend. As the weekend approached, the weather guys were predicting it to be hot and muggy - highs in the upper 90s and heat indexes in the 100s. I drove north up Highway 7 and finally made it to Jasper. I opted to not make the customary visit to the Ozark Cafe, and drove over the bridge there over the Little Buffalo River. I looked down at the waters and saw that they were running high and muddy. 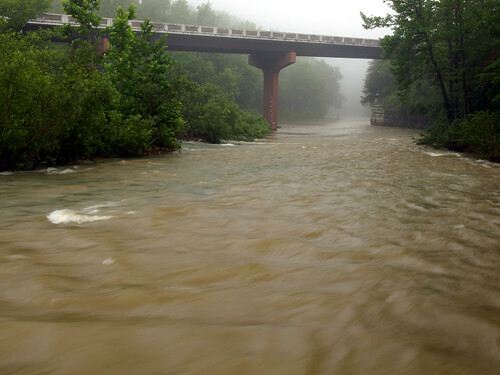 Unbeknownst to me, the watershed of the Buffalo River received several inches of rain the day before. 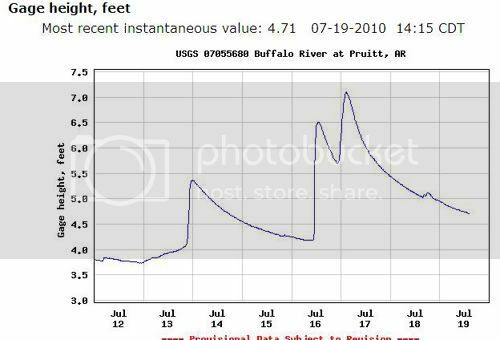 Which of course resulted in a significant rise in the water levels of the Buffalo, something that I had not planned on. This year has been a bit drier than normal, and I thought the river would be running low when I visited. So I was a bit surprised to see it up so high. The day I drove up there was July 16th, which just happens to coincide with the highest levels in the graph. I drove on towards the campground at Steele Creek, and was welcomed by the majestic bluffs that tower over the river and fields below. It was great to visit those old bluffs again, like seeing an old friend you haven't seen in years. And to make it even better, apparently it had rained earlier in the day in that area, since the thermometer in the car showed it was a brisk 76 degrees outside. It was still muggy, but almost pleasant. Much better than than the heat down in Little Rock earlier that day. I parked the car and went over to visit the river. It was indeed running high - the usually clear waters were brown and muddy. 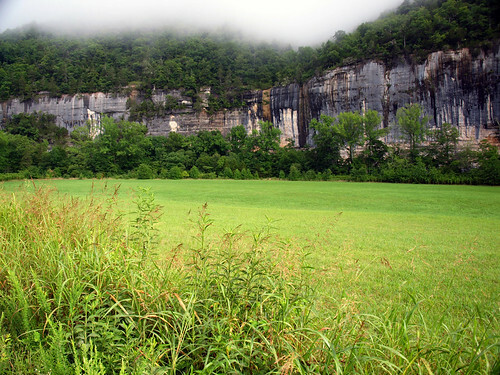 I headed over towards the campground, passing by fields that are overlooked by the massive Roark Bluff (which tower 220 feet above the river). 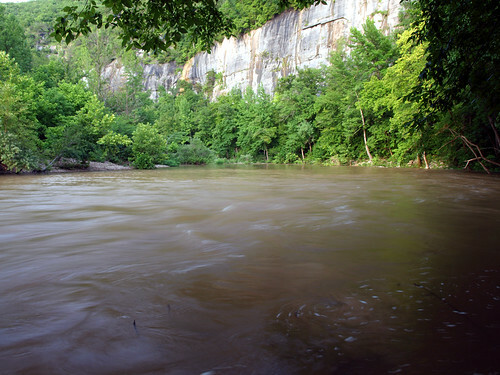 Roark Bluff isn't the tallest bluff along the river, but it is one of the longest (stretching for nearly three-quarters of a mile). From the campground, I managed to make my way back down to the river. There were a few people trying to catch some fish, and others trying to collect firewood. I set up the camera for a shot of the river overflowing its banks and cascading over a gravel bar. So on the 4th of July, we headed back out in search of a decent place to shoot the fireworks over the Arkansas River. 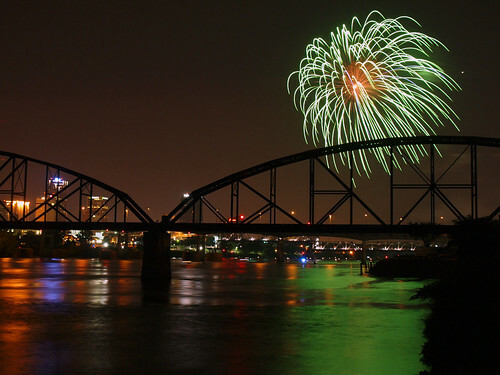 A probable site was along the North Little Rock side of the river, where hopefully both the fireworks and skyline could be squeezed into one shot. Before it got dark and too crowded along the river, we drove around looking for locations. Somehow we ended up driving over to the foot of the Clinton Park Bridge, on the north side. That angle provided a decent view of where the fireworks would go off - and one that was a bit different. I don't recall ever seeing fireworks shot from that view before. So we claimed a spot and waited for it to get dark. The spot we settled on was on what must have once been a boat dock of some sort. It was a concrete platform that jutted a few feet into the muddy water of the river. It was a good location to shot from, it had an interesting angle on the Clinton Library and the old rail road bridge next to it. 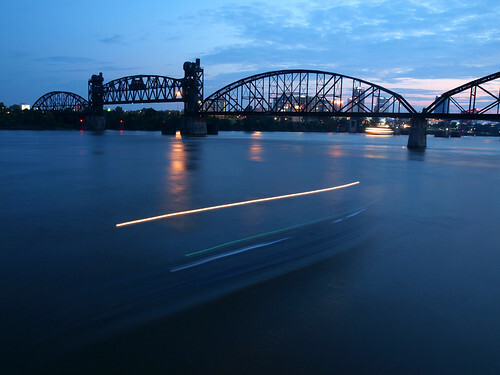 This is a shot of the Arkansas Queen riverboat passing below the bridge. And another shot of some river traffic. This was a Pulaski County Sheriff's boat, patrolling the waters just before dusk. The old bridge was built way back in 1899, and was in operation until 1980. 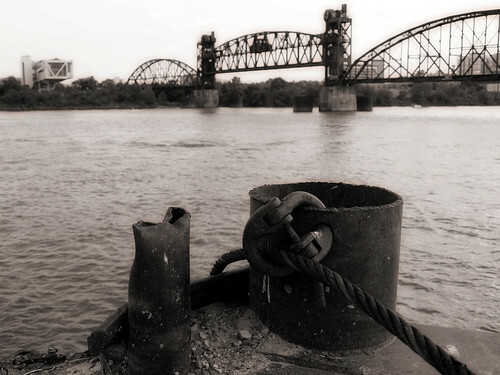 For most of its existence, the bridge was named the Rock Island Bridge. But earlier this year the bridge was re-named the Clinton Park Bridge (presumably because people were getting it mixed up with the Junction Bridge upriver). I kinda wish they had kept the Rock Island name, since it had a lot of history to it. But then again the new name is after a president, so I guess that's historic too. 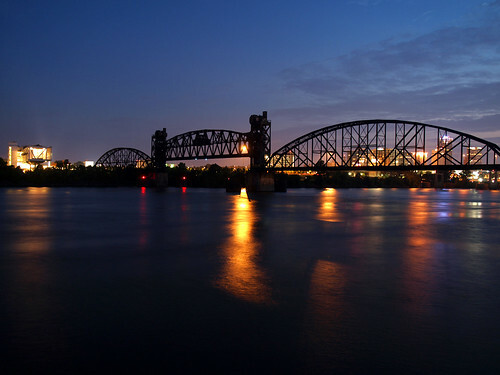 The bridge will be converted into a pedestrian bridge, and will serve as the final link on the River Trail projects that spans both sides of the river. Construction is expected to be completed next summer. For an interesting story on the bridge, check out this link from our local NPR affiliate (with pictures, too). On another warm summer afternoon a few weeks back, I meet up with John again for a trip to the small towns of Scott and Keo. 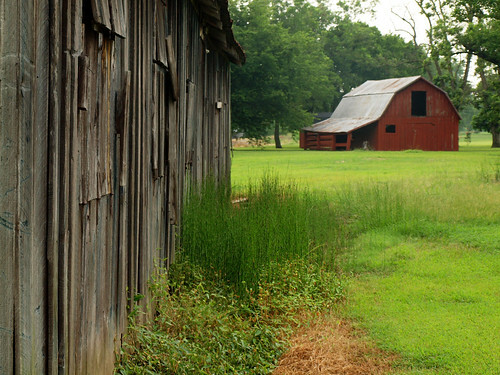 Located about 30 miles or so east of Little Rock, these two small towns have an amazing collection of old barns, plantations, gins and cotton mills. It's one of the better collections of old buildings in the state (up there with Boxley Valley). 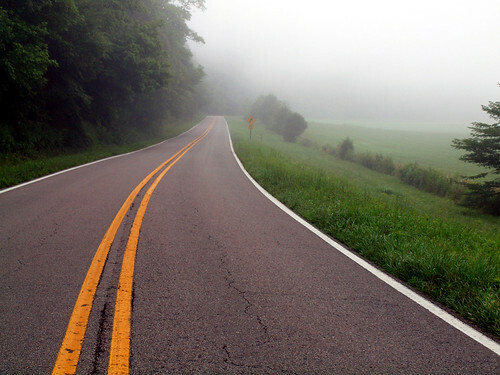 It is a neat stretch of road. 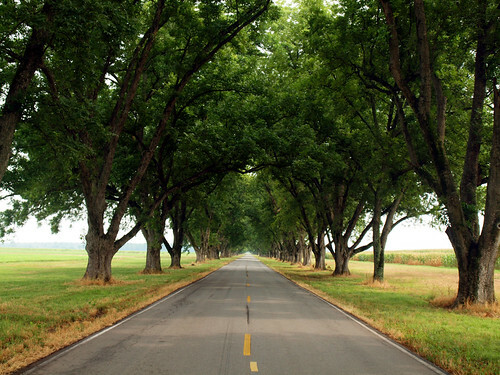 Pecan trees line the road for miles, with farmland on each side. 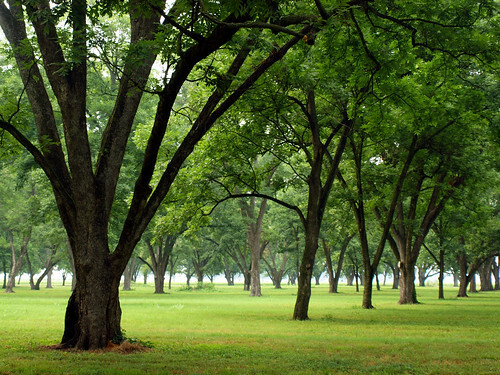 We drove down to a spot where there is a vast field of pecan trees (apparently the fertile soil here, right by the Arkansas River, is ideal for pecan trees). 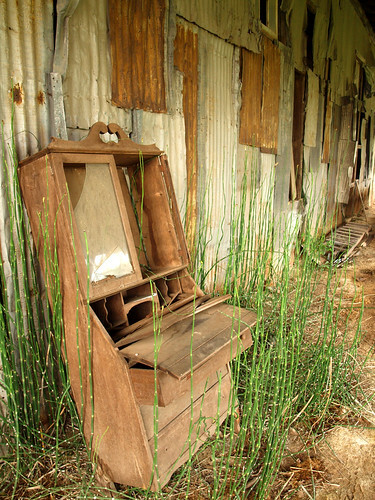 We stopped by an abandoned store, with this decaying old building behind it. 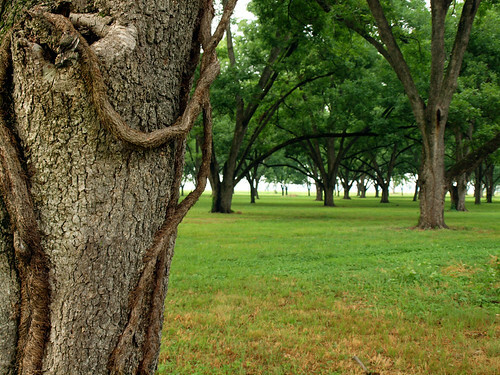 Just beyond is the pecan field. The trees here are old, and they show their age. Massive vines have travelled up the trunks. It seemed like each tree showed some unique and interesting characteristic that set it apart from its many neighbors. There is an old barn in this field that collapsed a few years ago. 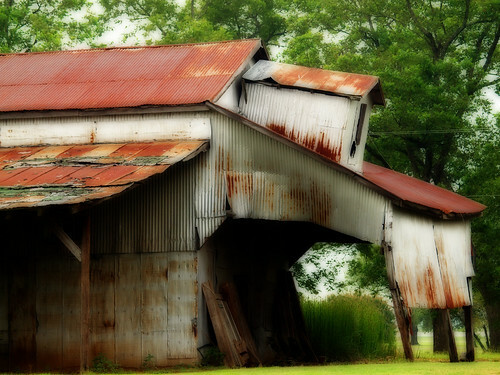 The walls and front must have crumpled inward, so all that you can see really is the top of the barn. What is now the floor appears to be the loft, which still has some hay in it. Beside the barn were the remains of a tree, which had massive populations of mushrooms and other various fungi growing on it. There were vast cities of mushrooms, some even bizarrely letting off steam in the afternoon heat. It was a weird but neat spot, and there were many pictures taken (which didn't really turn out). I wish I could have lingered longer. 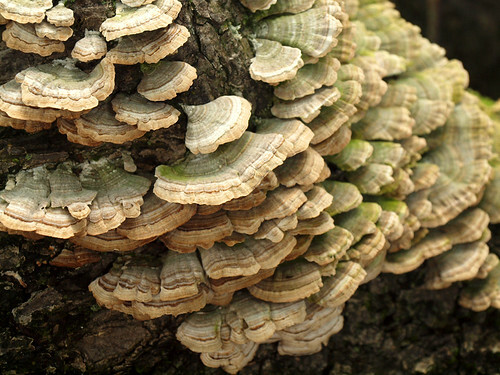 But besides being a perfect breeding ground for all sorts of mushrooms, it was also a busy place for bugs. Just judging on the number of bug bites I got, it's more like a bug Grand Central Station. 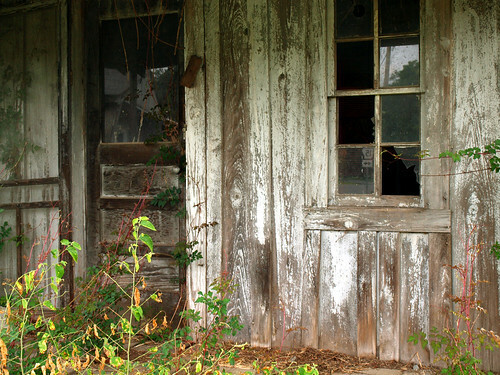 Heading back up the road towards Scott, I stopped at this old sharecropper house. We made another trip out there last year, and it looks like the old house has been repainted since then. The yard in front of the house was surrounded by standing water - it looked like the fields behind it were being flooded (I guess for rice?). And another barn along the road. This one sat further off the road, and I didn't want to drive too close since it was on private property. 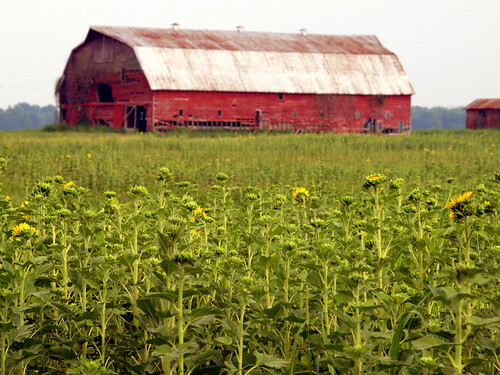 I got out the zoom lens for a shot, trying to work in the fields in the foreground (and some sunflowers). We drove over to Keo, located a few miles down the road. Keo is known for its antique stores, and pies (the pie place was unfortunately closed that day). In the center of town are numerous old buildings - lots of barns, homes, and cotton gins. One of gins is still in operation. I assume this is an old gin, but it doesn't see much cotton now. It sat next to an antique shop. The weird plant had grown up around this old piece of furniture at the old gin, guarding it like a castle wall.